Straightness: The pitum and oketz should be in a straight line. Even though it is kosher without this, a straight etrog sells for more. Cleanliness: A spot on an etrog – even when it is not black and not on the upper part, so it does not affect the kashrus of the etrog – effects its price. 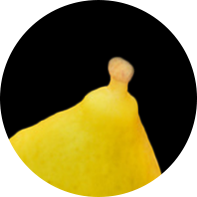 An etrog whose top is bent over, as well as any other noticeable departure in the shape of the etrog, although it is kosher, will be downgraded to Class א. A spot that is noticeable at a distance of 12 inches, even though it does not make the etrog pasul, will automatically place it in Class ב. 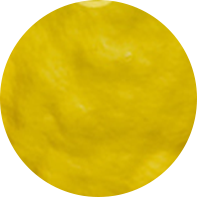 If the spot is visible only from a distance of 5 inches, the etrog will be placed in Class ג. 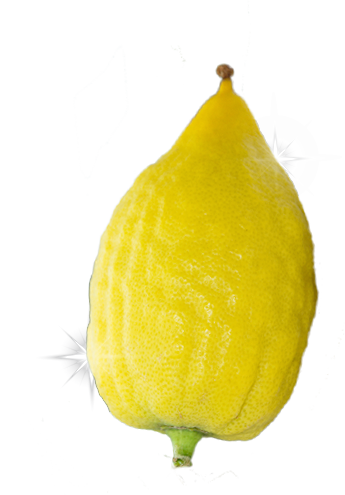 If there are no spots, or only extremely small ones, and the etrog has a nice shape, it belongs to Class ד. A set of Arab Minim includes 1 esrog, 1 lulav, 3 hadassim and 4 aravos. Note: Each of the four species has their own specifications to be considered kosher. An esrog should be wider toward the bottom, growing narrower toward the top. There should be no black spots on the upper half that are visible to the eye when the esorog is held at a normal distance. An esrog is pasul if it is round like a ball. If the spot is black, not brown or white as made by a leaf touching the esrog during its growth. If the spot is noticeable when the esrog is held at a distance of 12 inches. Only if the spot can be seen without searching for it. Only if the spot is on the upper half of the esrog. Only multiple spots will disqualify the esrog on its lower half. If the pitom broke off of an esrog after growing with a pitom. (Yanaver esrogim generally grow without a pitom and are therefore kosher.) This is only true of the pitom broke off entirely at its base on the fruit and none of it is left sticking out. Each leaf of the lulav is actually composed of two leaves that are connected along their height in front. If most of the leaves have separated into two, or even if just the center leaf (usually this is the tallest one) has split along most of its height, the lulav is pasul. If most of the central leaf is dried out (it has turned white instead of a healthy green), the lulav is no longer kosher. A lulav must be accompanied by three branches of hadassim that are meshulash, meaning the leaves grow in neat groups of three. If there aren’t seven consecutive inches that are meshulash along the hadas branch, it is pasul. The branch must be a minimum of 9.4 inches in length. If the pitom broke off of an esrog after growing with a pitom. (Yanaver esrogim generally grow without a pitom and are therefore kosher.) This is only true of the pitom broke off entirely at its base on the fruit and none of it is left sticking out.Some do not use a hadas if the tip of the branch is broken off. A lulav must also have two aravos branches with it. If the branch is less than 9.4 inches in length it is invalid. If the tip of the branch is broken off the aravah is pasul.